"I'm here, I'm here!" I actually got a tingly feeling in my heart the minute I caught my first view of Taipei city when we were on our way to Chiang Kai-shek Memorial Hall! 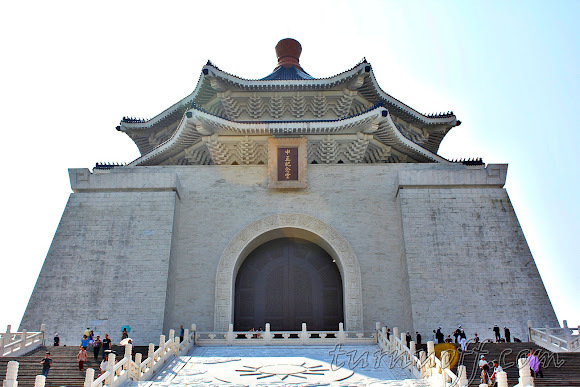 Lies in the heart of Taipei metropolitan, this memorial hall is an impressive landmark that honors Chiang Kai-shek, the first president of Taiwan. Covering an area in excess of 250,000 square meters, it's also home to the vast Liberty Square, the National Theater and the National Concert Hall. #1 Chiang Kai-shek Memorial Hall sits on the east end of the Liberty Square. #2 There are 89 steps leading up to the entrance of the main hall, which signify Chiang's age at the time of his death, April 5, 1975. Inside the memorial hall is a museum dedicated to his life. #5 A view of Liberty Square, with the National Theater (left) and the National Concert Hall (right) that standing opposite each other, and the beautifully landscaped Chinese inspired gardens. #6 On the other side of the Memorial Hall, there's another gate called the Gate of Loyalty with Taipei 101 (the tallest building in Taiwan and at one point in the world) in the background. 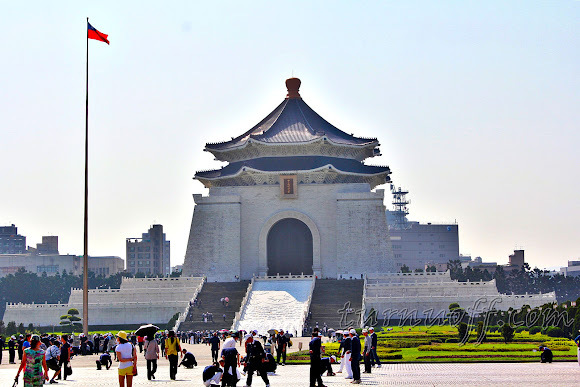 Well, you can't travel to Taipei without engaging with its history and the fact you see how those Taiwanese people can do for only one person is unbelievable! #11 Tourist coaches carried visitors from Japan, Singapore, Malaysia and China. #12 This was our spacious, comfortable and well-maintained coach that took us to places and sights all over Taiwan (airport transfers included). After leaving the Chiang Kai-shek Memorial Hall, our tour guide led us to a shop selling edible gifts. #13 It was a very quiet Sunday morning with virtually no traffic. #14 Directly opposite the south entrance of Chiang Kai-shek Memorial Hall, bridal shops occupy the entire side of Aiguo East Road. So here we were at the (shop name I can't pronounce)! #16 I asked our tour guide how to pronounce the name of the shop, but now that I try to remember, it seems I've forgotten it too. The minute we walked in, a man greeted us and brought us samples of their tasty treats to try. #17 The famous Taiwanese pineapple shortcakes... they were so delicious that I just couldn't stop eating them! What makes the shortcakes special is the pineapple filling, which is made using Taiwanese pineapples and a special recipe. Granted, I bought some of it to bring back home, but not from this shop. Visiting a country where barely anyone speaks English and all the route maps, shop and restaurant names, menus are in Chinese characters can be enormously challenging for non-Chinese speaking tourists! One of the difficulties foreigners may also face in Taiwan is that, though the directions or manuals are some printed bilingual now, they are not consistent. For instance, you will probably find both Aiguo and Aikuo or perhaps other versions too for the same street. So this can be very confusing for foreigners. With everything (including accommodation) arranged by the local travel agency, we stayed in different cities, different hotels every night, except the last two nights of our vacation. The hotel lobby is on the 10th floor of this building, the restaurant is on the 10th floor and our rooms are on the 10th floor too! The hotel is creatively filled with aboriginal crafts, paintings and decorations with each room distinctively designed in different aboriginal styles. I really liked the combination of vivid colors used in their decoration! I took so many pictures while I was here! So, I'll write about it in a separate post. I can't remember much about this hotel except that the room has two queen-sized beds! The hotel occupies level 3 and 5 of a small commercial building, which also houses a pharmacy, Toys R Us, etc. Strange combination of occupants but I guess this is Taiwan! Oh, and there is a McDonald's downstairs. OMG I just realized something... there was no window in our room! Okay, I just realized I didn't take any pictures of the room too. Anyway, I'll also write about this hotel in a separate post. View of the building across the street from the hotel. Being on the move constantly and sleeping in a different bed every night may take its toll on the enjoyment of your vacation, but I was dead tired from sightseeing/shopping all day so I had no problem falling asleep at all! As soon as I got to my hotel room, I unpacked a bit, took a warm bath, collapsed on the bed and slept like a log. What mattered most to me? Clean and comfortable bed, clean bathroom and thick fresh towels, and get a good night's sleep! The following morning, the phone rang at 6am. It was our wake up call #fml. I awoke refreshed, showered, packed my suitcase, and headed down to the breakfast buffet and then ready to be herded like sheep from one destination to another.